Just Follow the Joy! 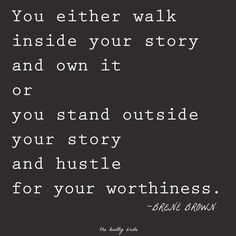 • This entry was posted in community, motherhood, truth-telling and tagged blogging, brene brown, courage, healing, motherhood, stories, storytelling, truth-telling, vulnerability, writing. Bookmark the permalink. I SO get it. I walk in my story. It is not easy at times, but it is all I have in the end. Love that you did. Of course you understand! You do it all the time in your writing and art. It is beautiful and I am so inspired by you! Omg you’re too sweet! The feeling is most certainly mutual! Oh how I relate to this! I, too, am very private and share very little on Facebook. When my essay detailing my struggle to get pregnant was published, I felt sick for days. I would think of it while driving or grocery shopping and my cheeks would flush and I’d feel faint. It took me much longer to reach a peaceful place with it, and I was never able to bring myself to post it on my own FB page, although it was circulated by supportive friends and family. But now it feels so different. I feel so unburdened. There is tremendous power in taking control of the narrative. First raw vulnerability, then power. And connection and joy. Congratulations on your beautiful publication!! I can feel all the amazing energy coming through in this post!